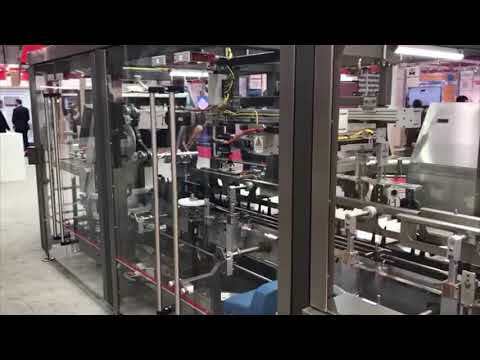 Embracing the future with Industry 4.0 innovation, engineered and manufactured in the UK and US, Bradman Lake packaging machines incorporate the latest integrated connectivity Industry 4.0 technology to communicate seamlessly over a common network and protocol. This enables the installation of customised systems that deliver enhanced productivity, rock solid security and operational intelligence with live data output to drive smarter management decisions. This flexible, intelligent system allows for an exhaustive range of possible system configurations to meet every conceivable packaging need. Factory talk was utilised to link each machine, providing system control and performance data locally at each of the machines HMI’s. Real time data was transmitted remotely, to a secure machine cloud. Utilizing Rockwell Automation’s ‘Factory Talk Analytics for machines and devices' simple dashboards were displayed, providing real time machine and system data that can be viewed remotely from around the globe.